Pedal up to the best views of Madrid! The guide for your Private tour will conveniently pick you up from your accommodation to fetch your bike(s) together. Once at the rental center, all desired adjustments to the bike are possible. You can even bring your own SPD (or similar) shoes. No extra charges are involved. This MTB-adventure offers a first-hand impression of Madrid's most natural side. 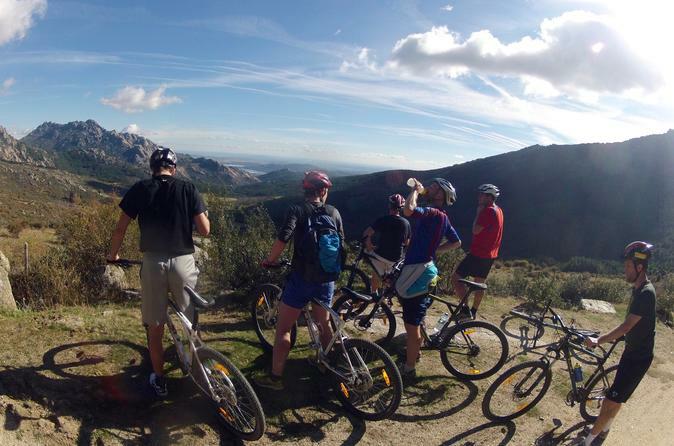 Madrid offers various delicious options for MTB fans, all at a heartbeat from the city center. Just jump on your bike and exchange the busy streets for peaceful trails and clean air. Mountain Biking is one the most popular activities for the ‘madrileños’ and there’s a good reason for it: it’s SO easy to go for a super nice ride. Your guide will conveniently pick you up from your accommodation to fetch your bike together. Once at the rental center, you will have the possibility to make all desired adjustments. You can even bring your own SPD (or similar) shoes to make the ride as Personalized as possible. If you've been in touch with the guide beforehand, you can let him know if you need any other adjustments or simply have them done in your presence. There are no extra charges involved. Madrid’s city forest Casa de Campo is an excellent option for Mountain Biking in Madrid. Seven thousand acres worth of urban outdoor paradise lie at just 10 minutes from the city center. You'll bike right into the peace and quiet of nature and discover countless trails just waiting for you to enjoy... The 3-4 hours long Mountain Biking Adventure offers the perfect getaway from the buzzing city. The first mile or so takes you along the beautiful Riviera of the Manzanares River. Once you enter the Casa de Campo, you'll find yourself in what once was the private hunting ground of the King. Your knowledgeable guide for this Private tour will be able to take you on a large variety of single tracks without repeating any of them. Challenging climbs, defying down-hills, a loop around the city zoo... You name it! You can let him know at any moment what you feel like and the pace is kept enjoyable for the entire activity. If you take a 10-minute car drive from town, you can give the challenging terrain of “El Pardo” a try. Your guide will have the pleasure of showing you this surprising natural area, filled with wildlife and oxygen. Put your experience to the test and race some of the most fun down-hills Madrid has to offer for mountain bikers. Choose this tour option and you'll discover a genuine alpine area you’d never expect so close to a metropolis like Madrid. The 150.000 acres large National Park is a delight for every mountain biker. It stretches out over more than 80 kms and reaches 2.428 meters above sea level on its highest peak. After an entertaining drive of 45 minutes and all geared up, you're ready to enjoy the endless possibilities for mountain bikers on all levels. These 3 to 4 hours of mountain biking are guaranteed to show you some of the most unique nature in Europe. It will be the highlight of your trip.